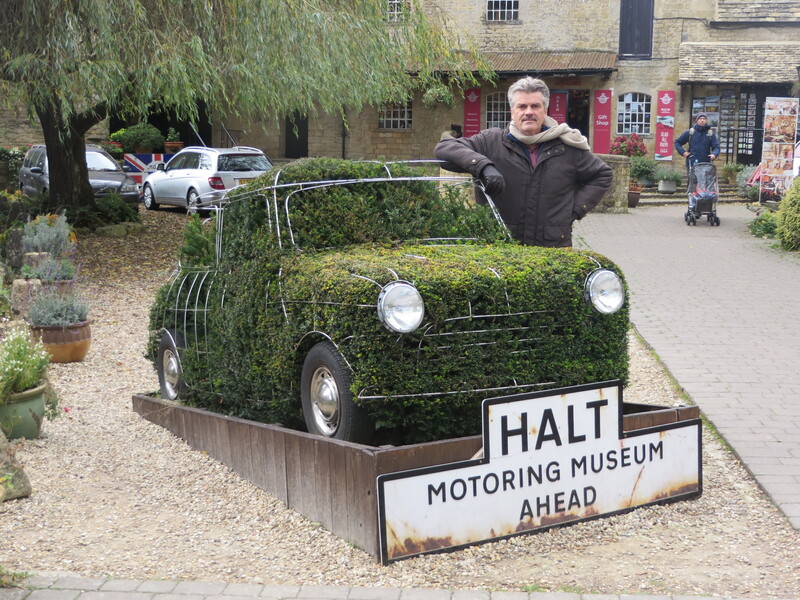 With three weeks available, cherry-picking the best attractions in the whole of England was no easy feat!! After a long (800km) drive from the Isle of Skye south to Birmingham where we attend the “largest” motorhome and caravan show! Very interesting but we come to the conclusion our old, faithful and trusty “Bruce” is still our preferred travelling option ….. most affordable and his layout (bed lowering from above the front seats at night leaves the interior for a large table that seats 4 and also long settee/couch – and a good bathroom with shower) suits us best! 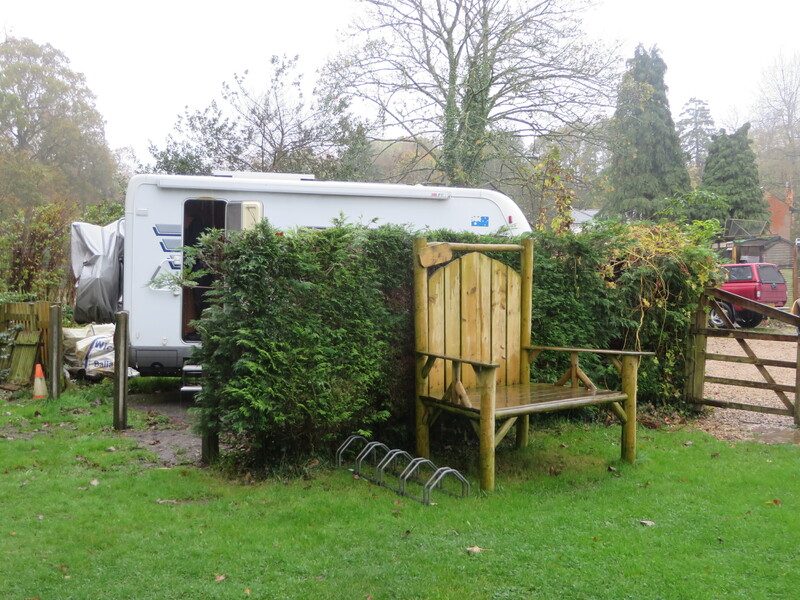 We overnight in the small village of Rugby, near Coventry. For Rugby fans, this is where The Rugby School in 1823 was born & where the game of rugby first began! 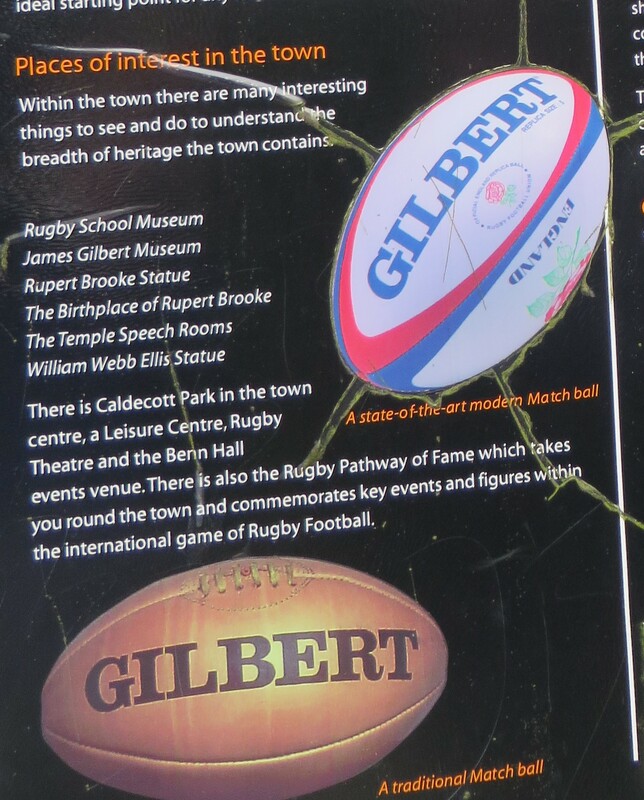 “GILBERTS” in Rugby is where the rugby balls have been made since 1820’s!!? 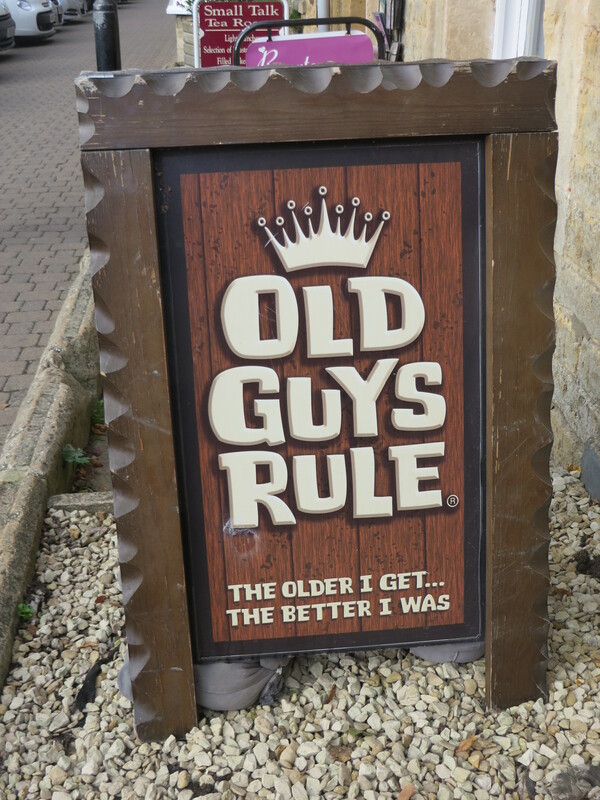 We meander through rural Warwickshire, Oxfordshire and to the historic Cotswolds . 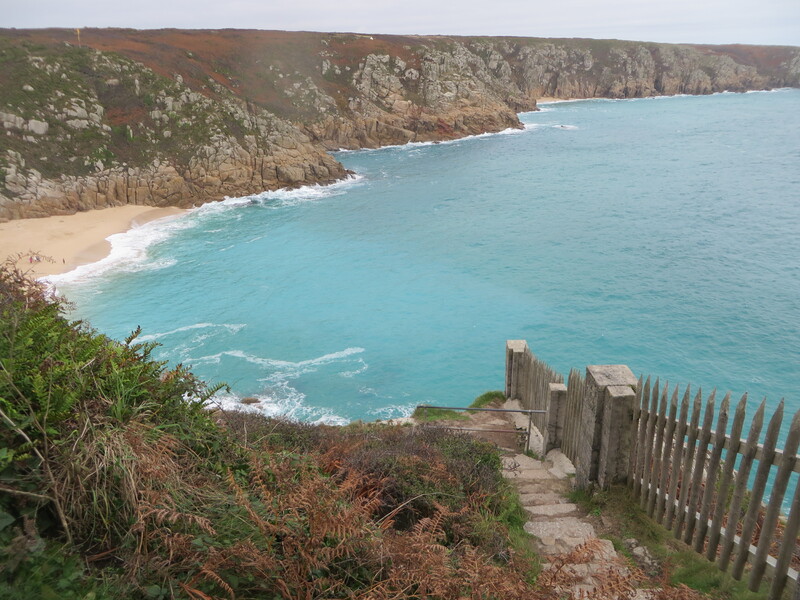 . . .a blend of bustling market towns , breath-taking scenery and evidence of Roman settlement / occupation. Enthralled on our visit to Britain’s Ultimate Castle . 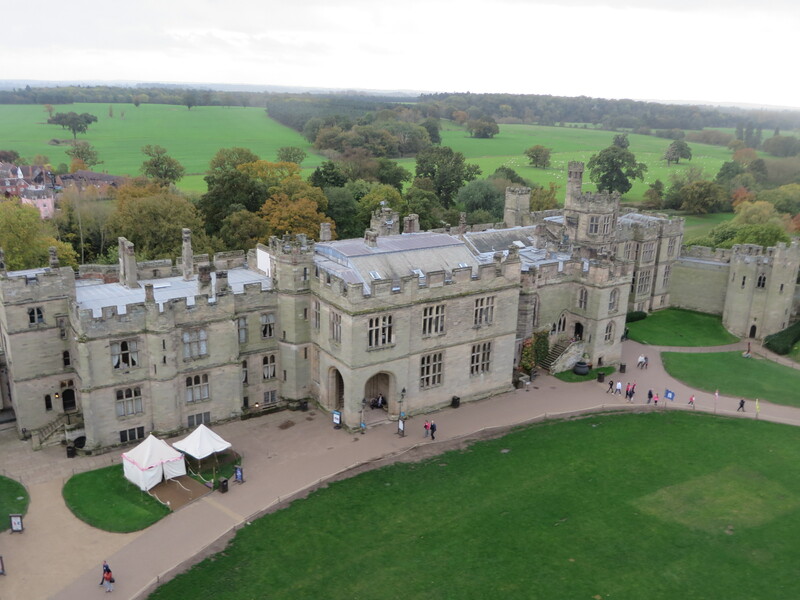 .. . Warwick Castle. 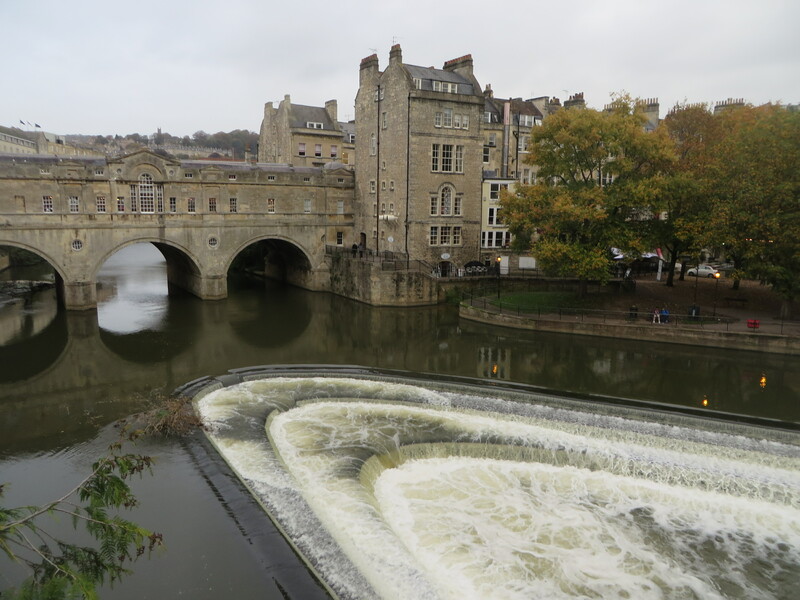 There has been a fortification of some description overlooking this part of the River Avon from as far back as 914AD. 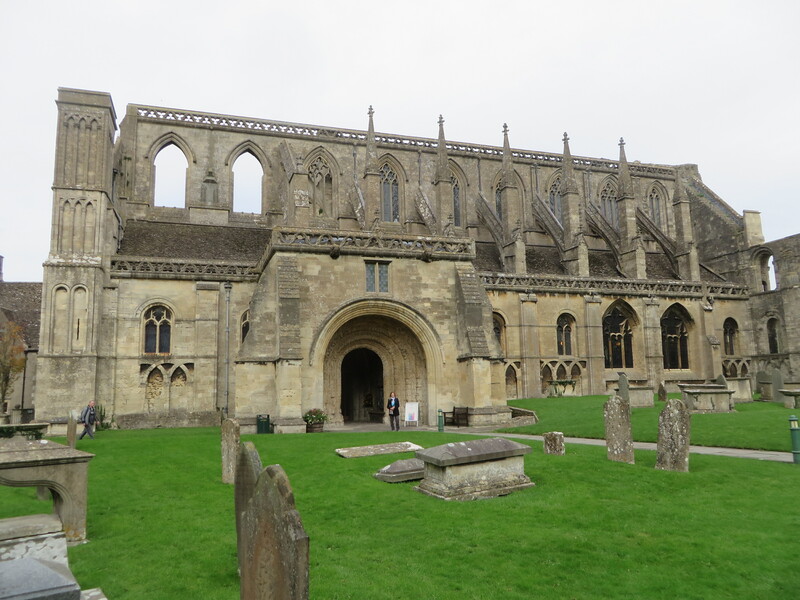 William the Conqueror was responsible for the first castle built on the present site in 1068. “Real Life” wax figures bring history to life in the library and music rooms. Significant investment and restoration is evident. 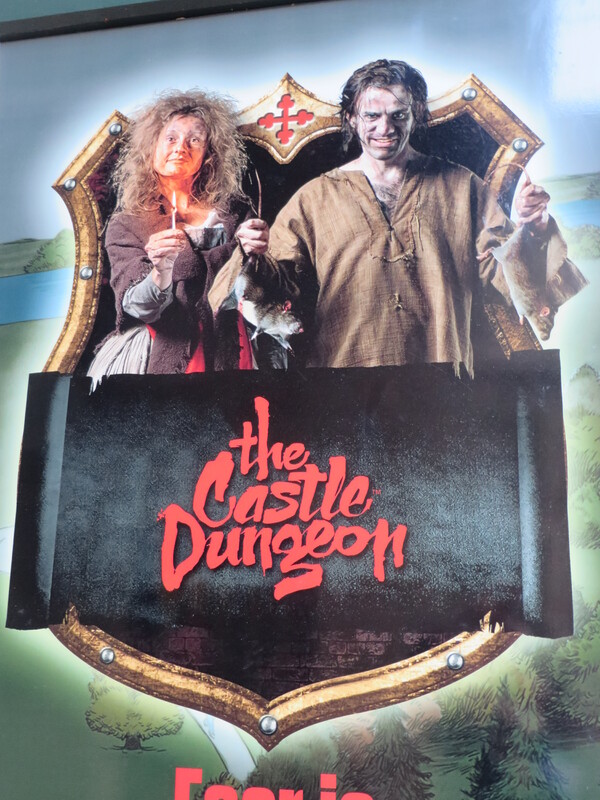 The dark side of the castle’s history is depicted in the “Castle Dungeon” with live actors, special effects and horrific stories dating back to 1345 when The Plague gripped Warwick. 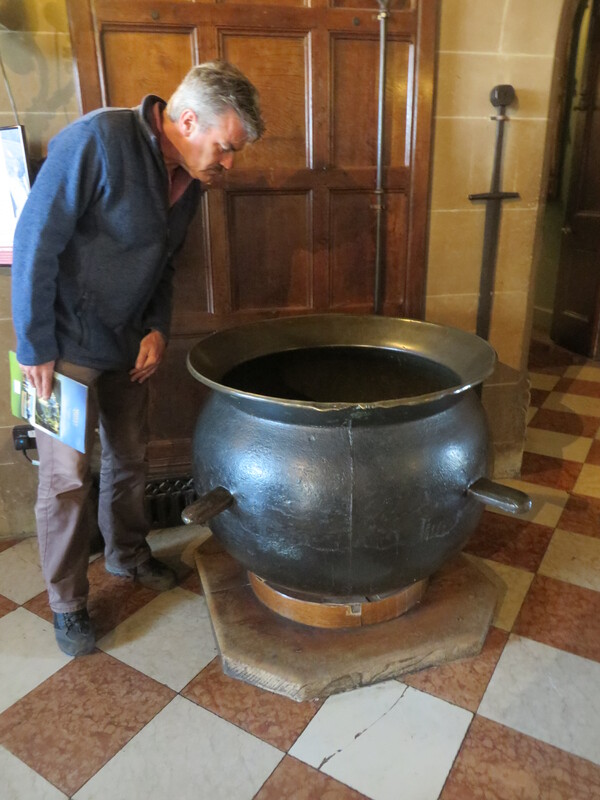 The huge cauldron or porridge pot is 500 years old and was used to cook stew for the castle’s soldiers. 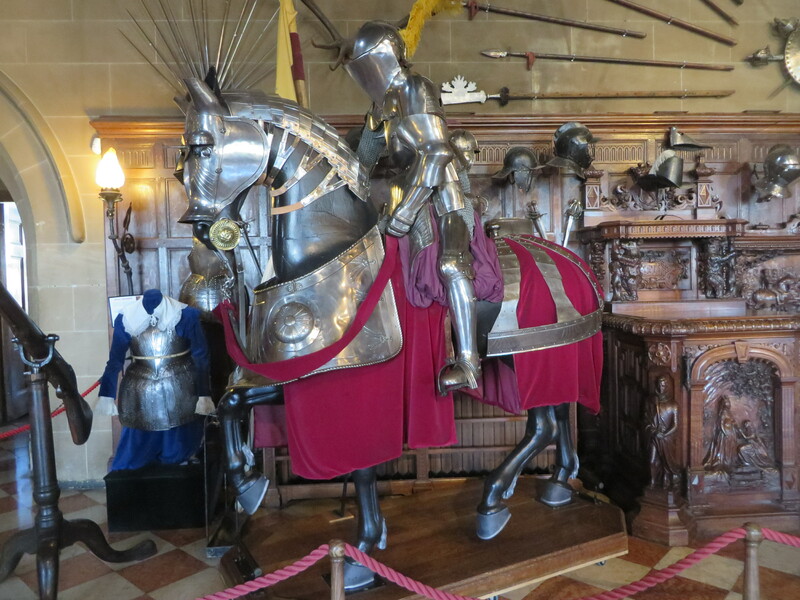 The equestrian and Soldier armour was very impressive too. We watched the “trebuchet” in action! . . . . . . The trebuchet was the largest and most formidable of the siege machines and was, in essence, a huge catapult. 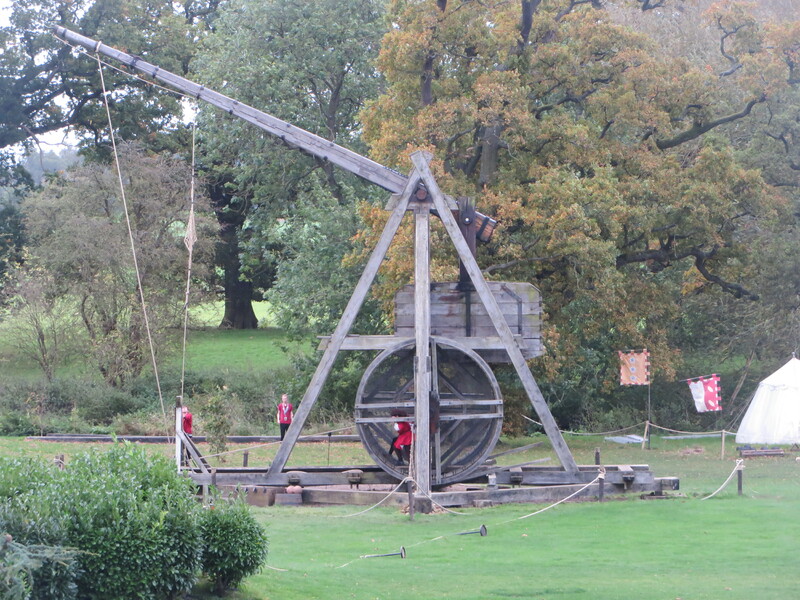 The trebuchet was used to hurl huge projectiles to breach the castle walls. Large rocks and stones were the main ammunition but there is evidence of more unusual material. Manure and dead animals were also hurled by the machines into the besieged castle to spread disease! Pigs were often picked as the animal of choice as they were thought to be more aerodynamic! In this case, pigs most definitely could fly! 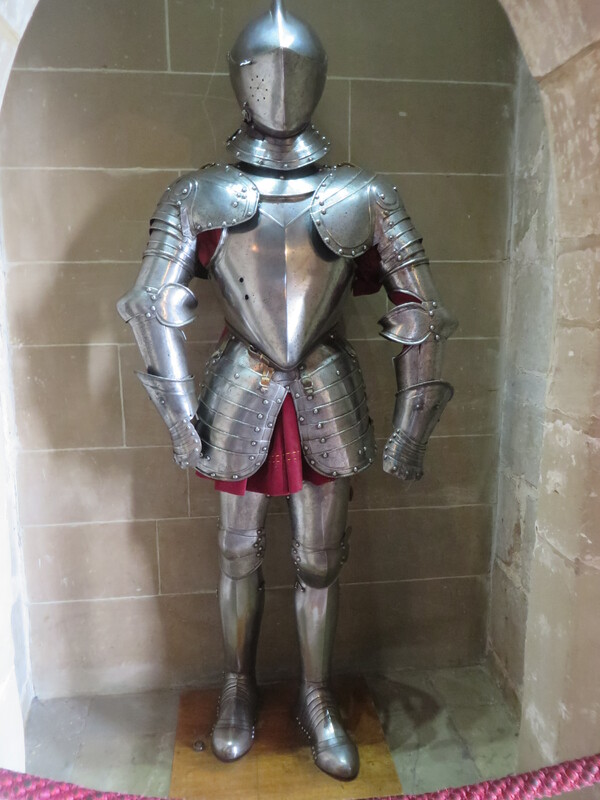 The castle has been home to Earl of Warwick until 1978! The ancient rooms shed light on defining chapters in Warwick Castle’s past to reveal tales of battle, siege, murder, power struggles and hauntings! 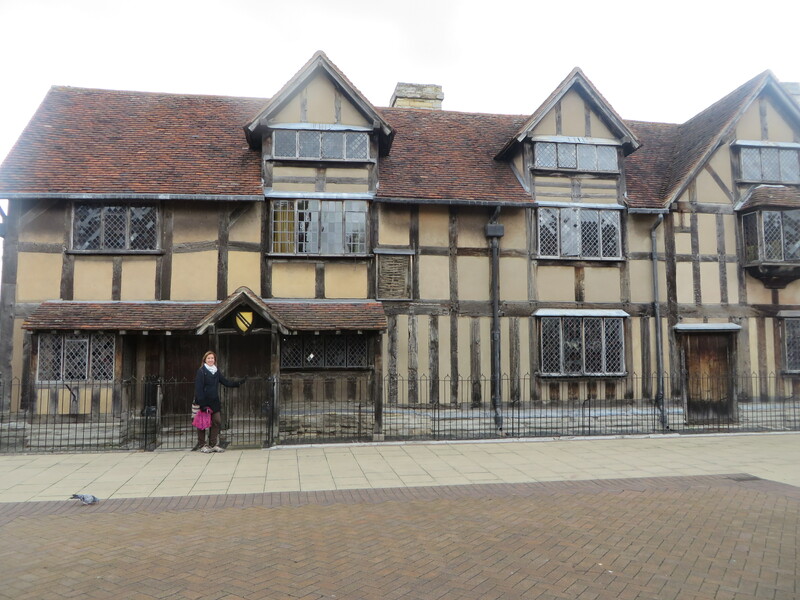 In Stratford –upon – Avon we wander along one of the most important historic walks in the country. 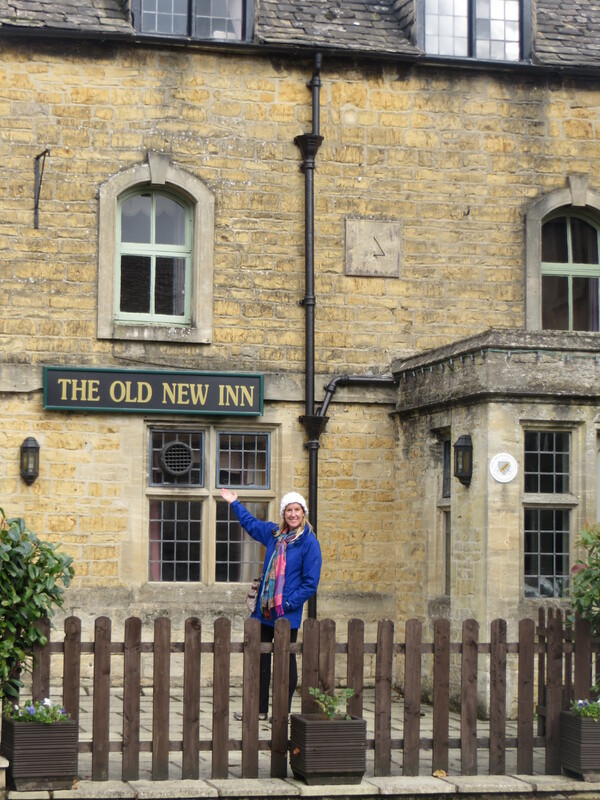 Bev stands outside the 16th century house where William Shakespeare was born!! 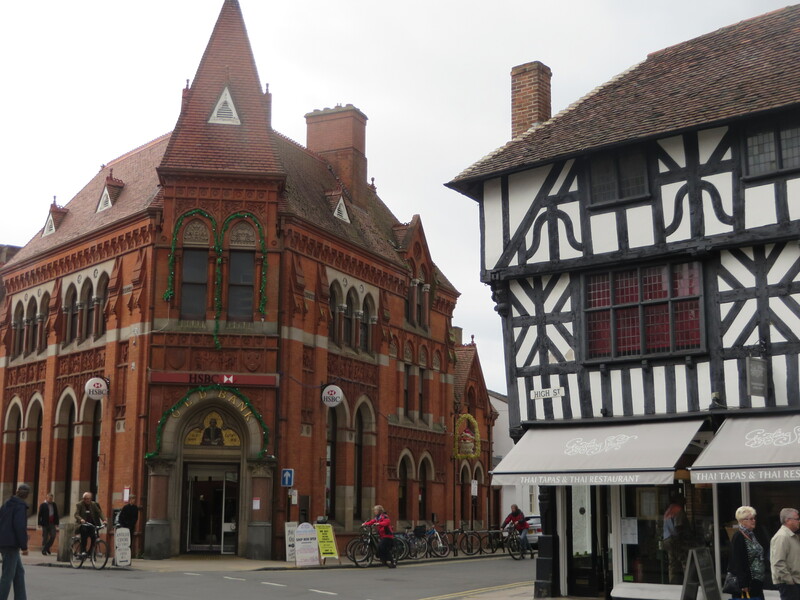 The red bricked Victorian building is the HSBC bank of 1883 and has a terracotta freeze depicting 15 scenes from Shakespeare’s plays! 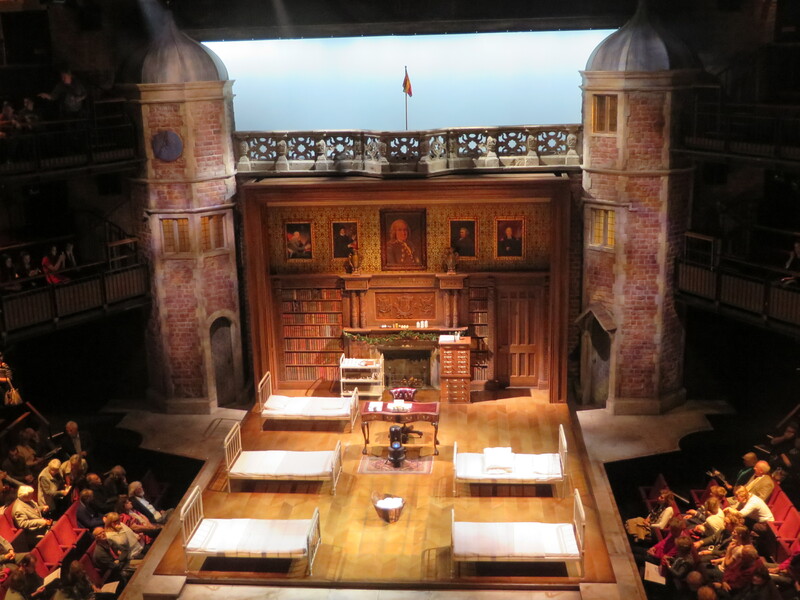 Inspired by our day out, that evening we are perched up in the centre of the dress circle in the Royal Shakespeare Theatre watching the Royal Shakespeare Company !! Having purchased last minute, affordable tickets, we are taken back in time to post-war 1918 and enjoy Shakespeare’s comic romantic play called “Much Ado About Nothing” also called “Love’s Labour’s Won”. Excellent acting and stage props. 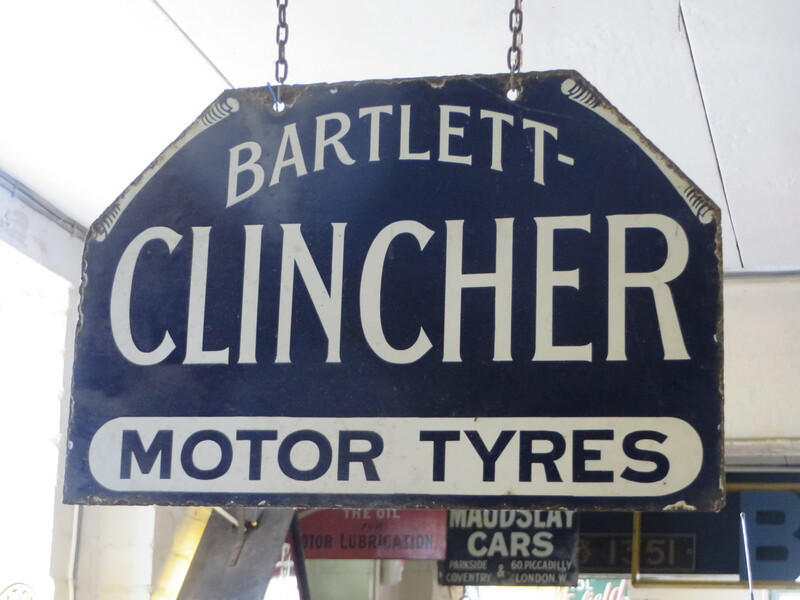 The sets were post war 1918, with the original 16th century language – hard to understand at first, it was like another language – but the comedy came through and we had a great time. The 1st scene is set in a hospital ward as soldiers have returned from war injured. 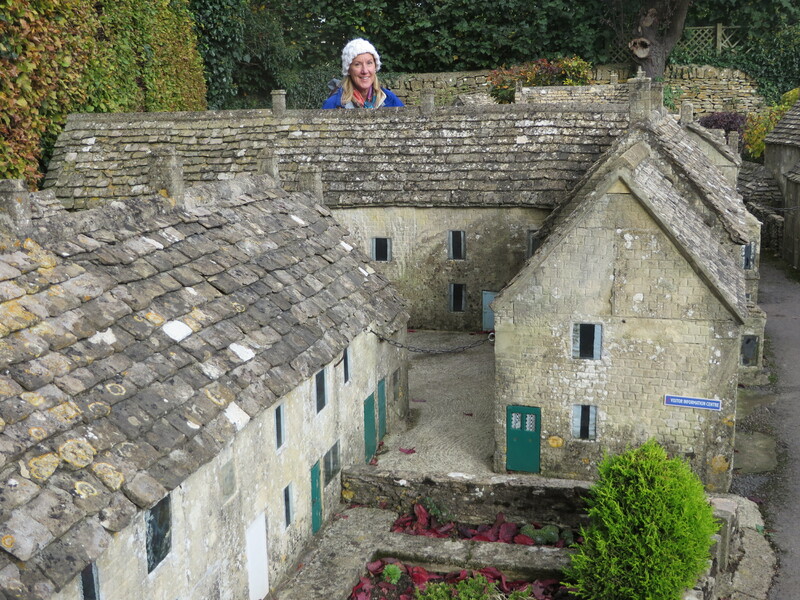 The miniature village of Burton – on – the – Water (in Burton-on-the-Water), built 1/9 th scale, was worth the visit1 We feel like we are in the town of the giants too . . . . ha!! 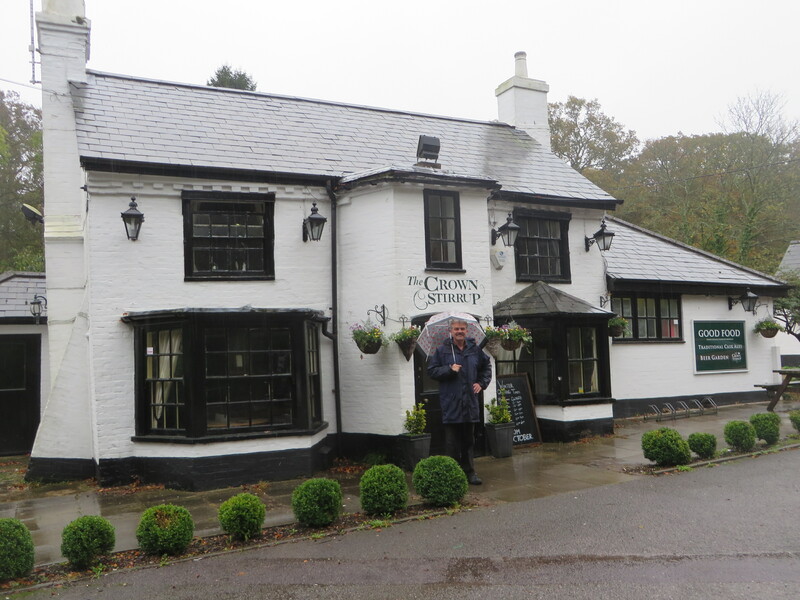 The village was opened in 1937 to celebrate the coronation of King George VI and Queen Elizabeth. Many quirky, amusing things observed along the way . . . 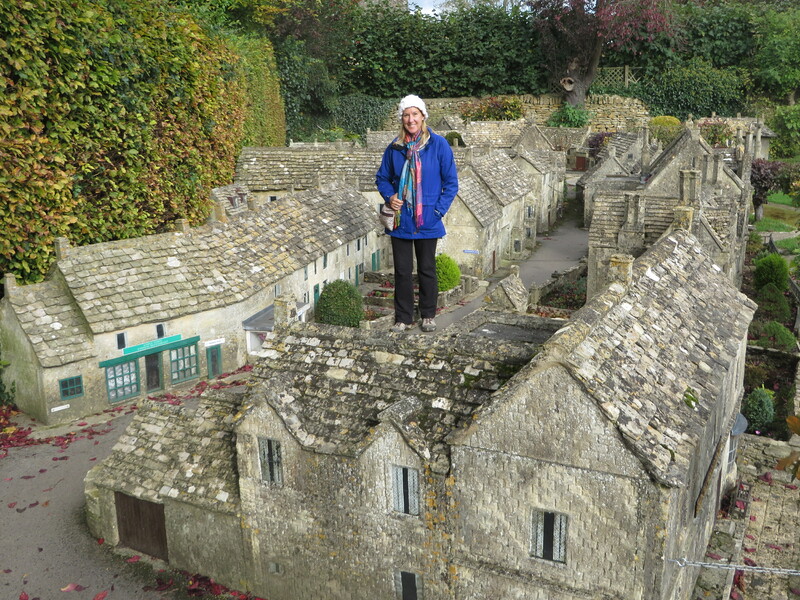 The Cotswolds with its ancient woodland, lively towns and many historic villages that are built from locally quarried “honey coloured stone is called an Area of Outstanding Natural Beauty! It is rich with history (Roman) and many traditions . . . . including Naked Gardening!?!?!?! 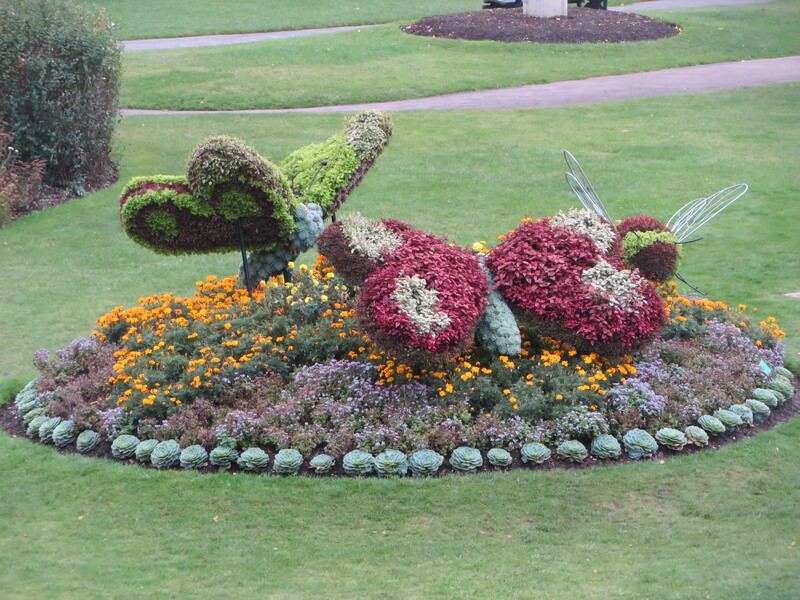 Yes, the Abbey House Gardens, Malmesbury, is home to The Naked Gardeners and the old TV show of the same name!! We don’t remember much about the show & perhaps that is a good thing. However, the gardens are beautiful & influenced by the site’s history & the fact the Benedictine Monks once gardened there! The ancient abbey church of St. Peter & St. John is pictured. 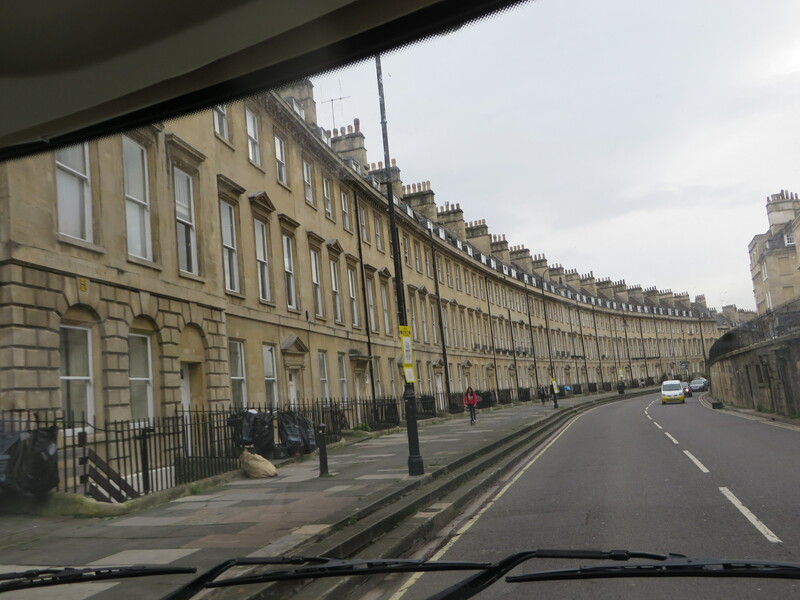 Excitement is mounting as we arrive in the beautiful city of Bath . . . . and our afternoon tea with her majesty! 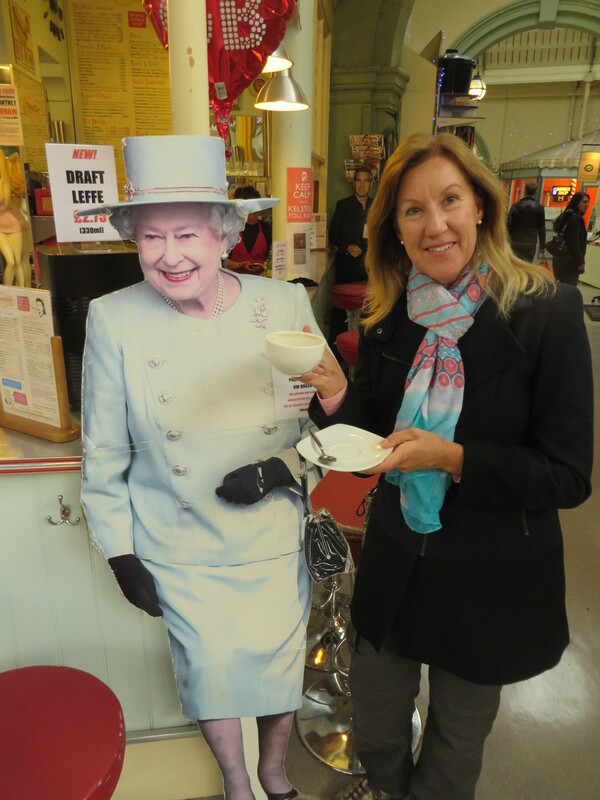 . . . . Bath is a sophisticated city with over 5,000 heritage listed buildings and a grandeur unmatched elsewhere in Britain . . . . it seems a highly appropriate place to share a cuppa and a scone or two with the Queen of England!! Passing the famous Roman Baths and the Royal York Hotel Bev finds the Queen patiently waiting for her in the Bath Market Arcade! She is in a delightful pale blue suit completed with top hat and I feel under-dressed and overwhelmed!! After we down our tea & a plate of delicious scones . . . . elegantly as possible of course . . . . she has a surprise for me!!? “I thought you might like to meet my adorable grandson! She states . 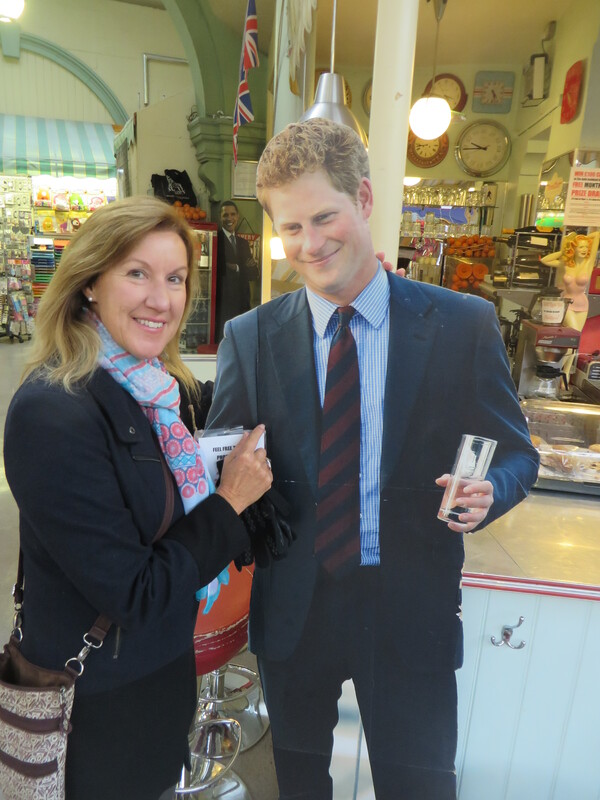 . . Bev faints to find herself being picked up by the ever cheeky & handsome Harry!!? We share some jokes and I notice he is only drinking water today!! Mmmmm . . . maybe I’ve been drinking too much coffee!? Ha! Ha! 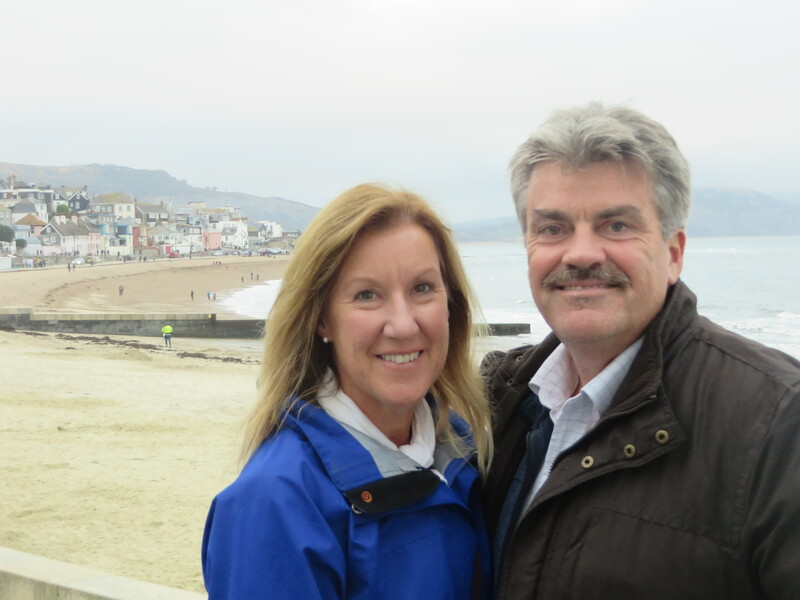 Our second meeting with the Royals . . . . actually ex-royal, was at the bar of The Volunteer Inn, Wiltshire! We shared a beer or two with Princess Anne’s ex-husband (Mark Phillips)’s sister!! She was dressed INCOGNITO in old baggy “tracky” pants & worn-out jumper . . . .. IT WORKED . . . . no resemblance to Mark Phillips or royalty. 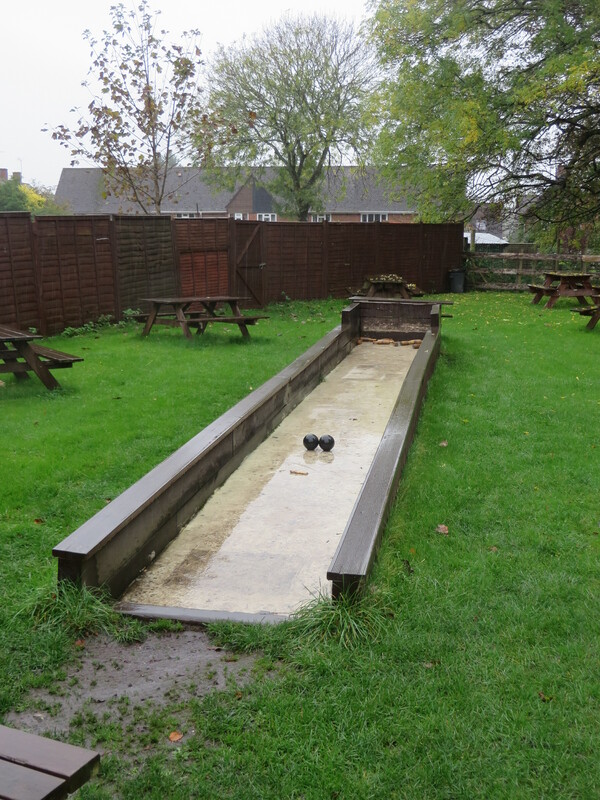 Later in the evening she joined 20 others at the skittles competition held inside the pub! 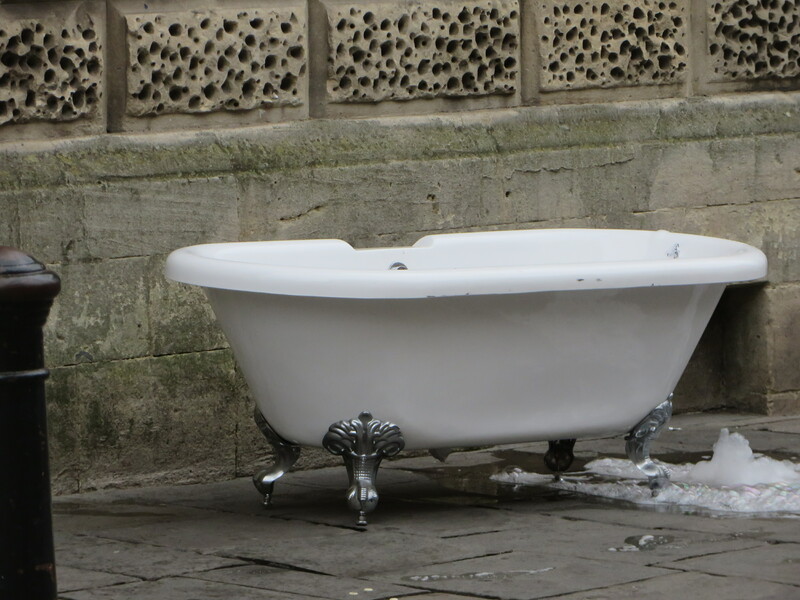 Beautiful butterfly gardens and also this royal looking bath – – on the street in Bath!!? 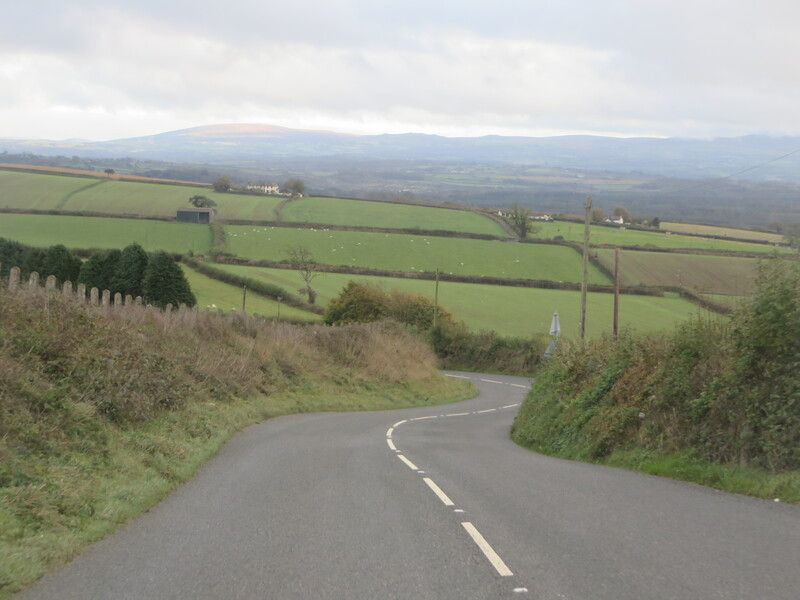 We have watched some “Midsomer Murder” episodes on our laptop during our travels and made a detour to Midsomer Norton! 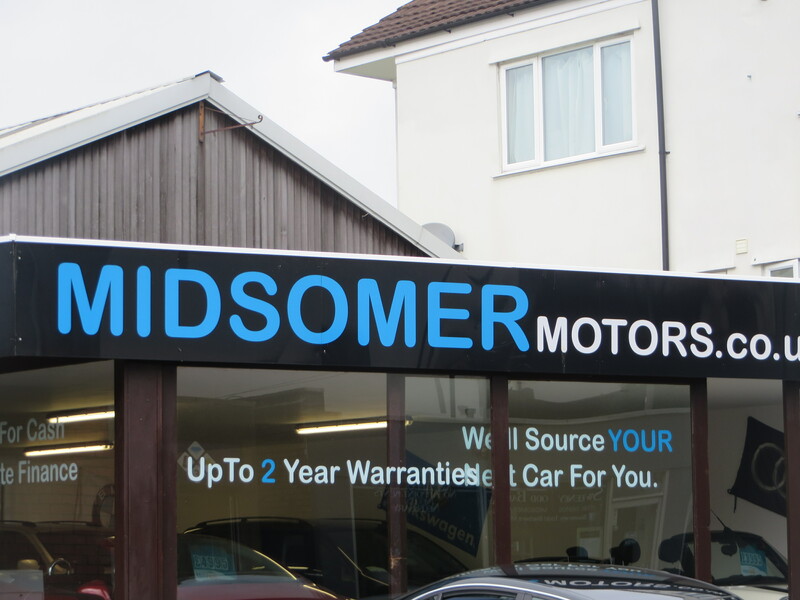 . . .. found Midsomer M…..otors!. . . . no murders visible that day!! 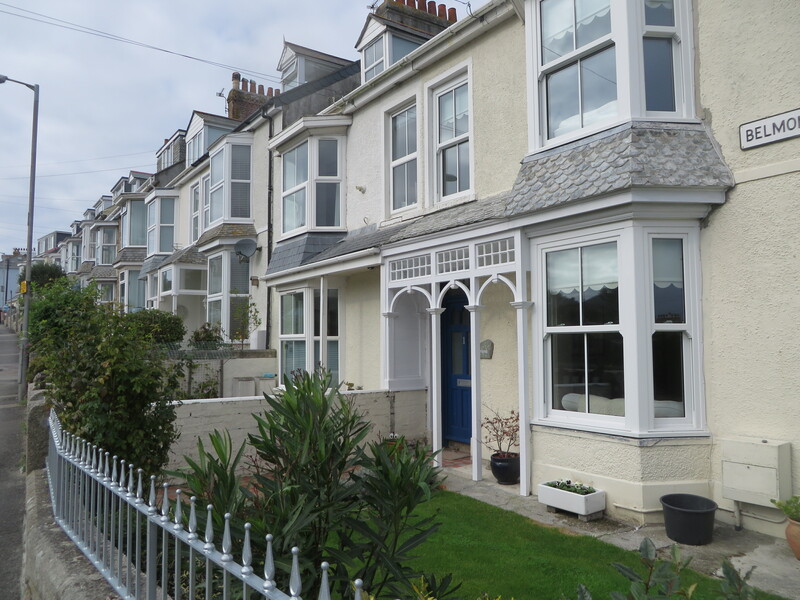 North Devon has wooded valleys, windswept moorland & rocky coastal cliffs tumbling into the sea. 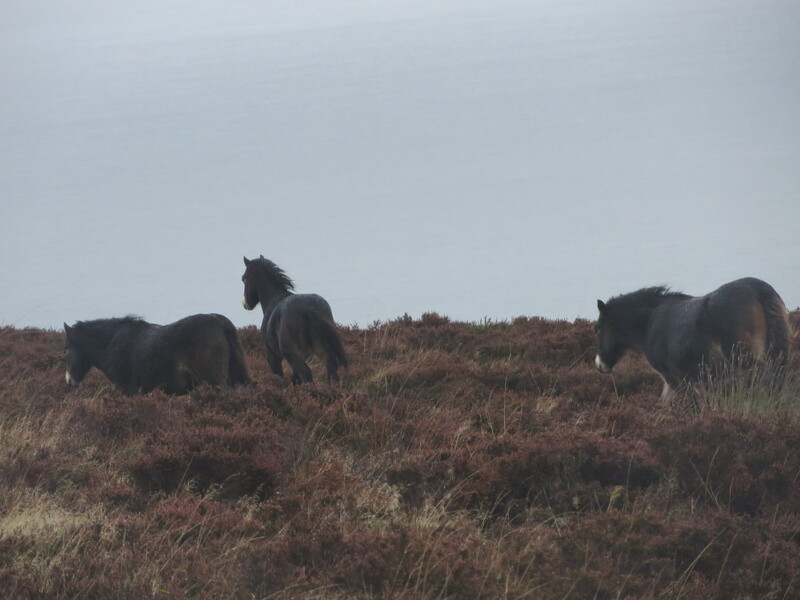 There are herds of wild red deer and we manage to find some rarer Exmoor Ponies running free. 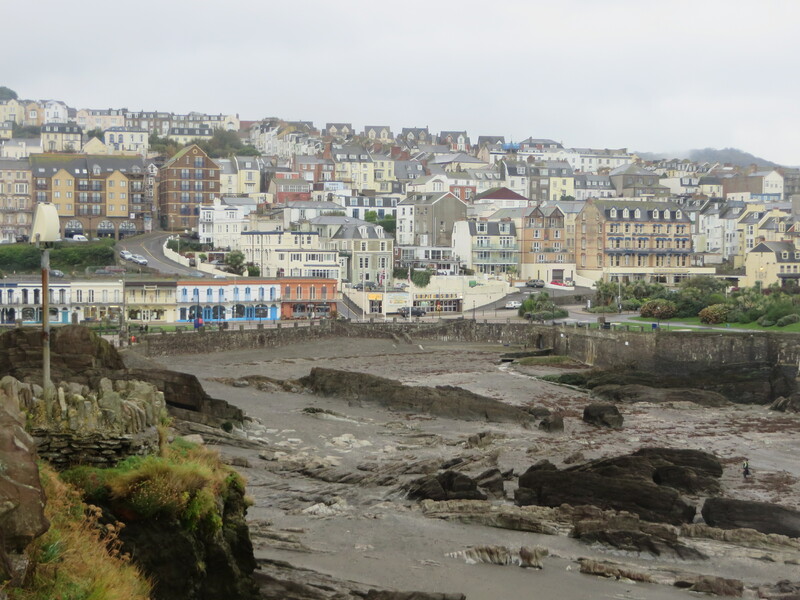 Ilfracombe, North Devon’s largest seaside resort had a colourful wall of red crocheted/knitted Remembrance poppies on its cliff wall. 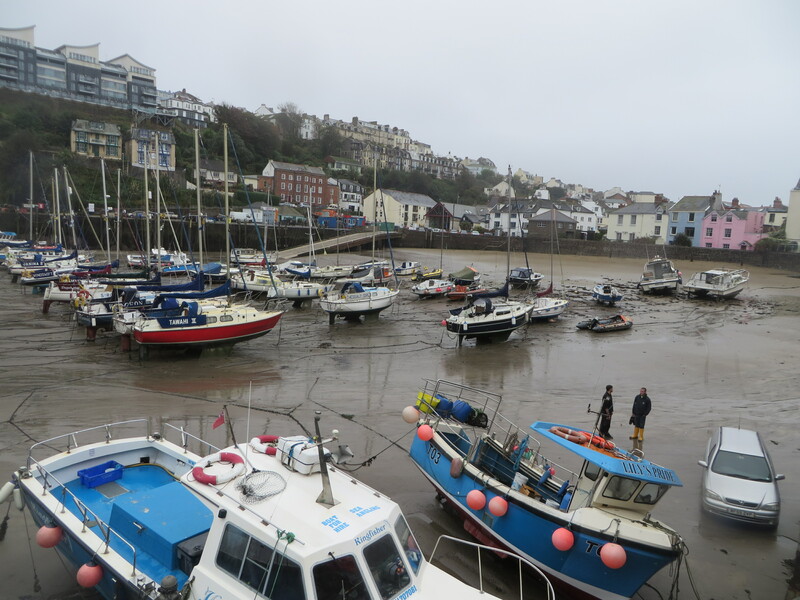 The wide variance in the tides was obvious here . . . cars even driving down to the boats (see bottom right of photos)! 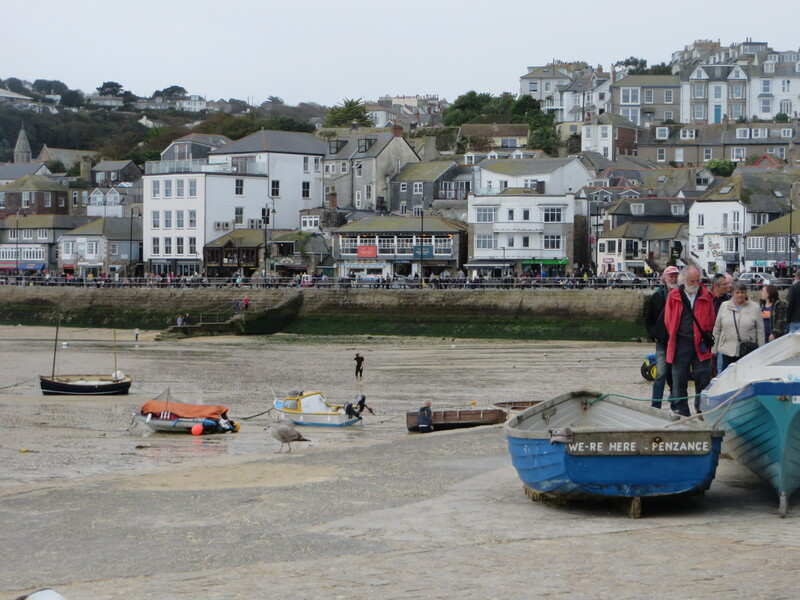 We ate Cornish Pasties in Cornwall – we had to try some – as we walked along the attractive beach promenade in popular St Ives. 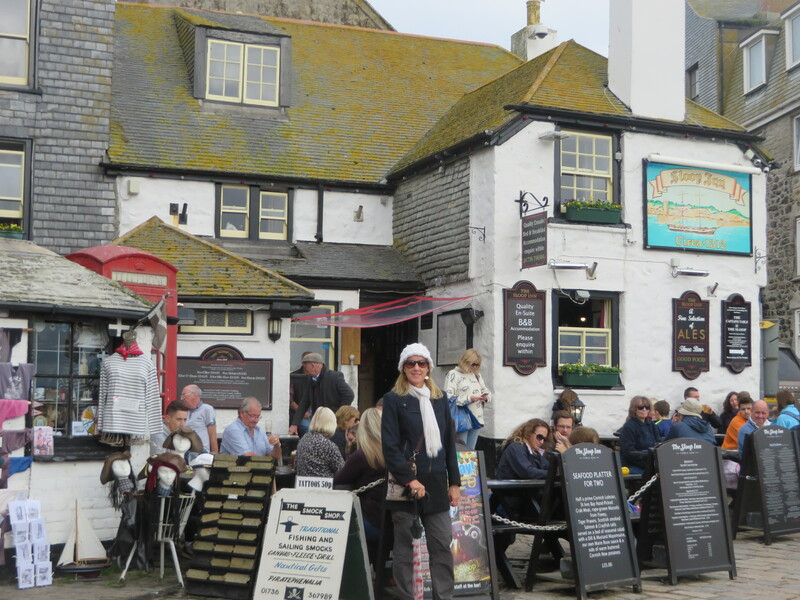 The Sloop Inn, pictured here with Bev was circa 1312!! 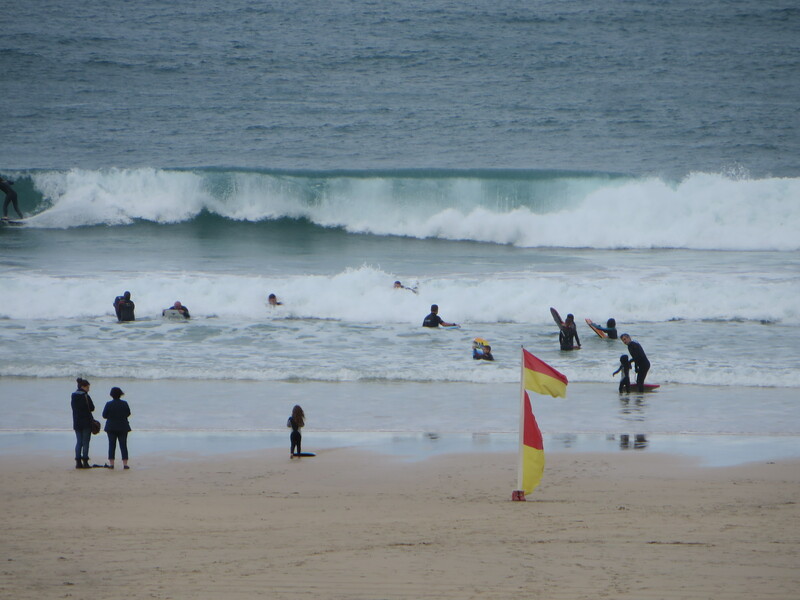 St Ives, nestled into the cliffs is a thriving holiday town with white sand surf beaches and attractive holiday homes and art galleries. 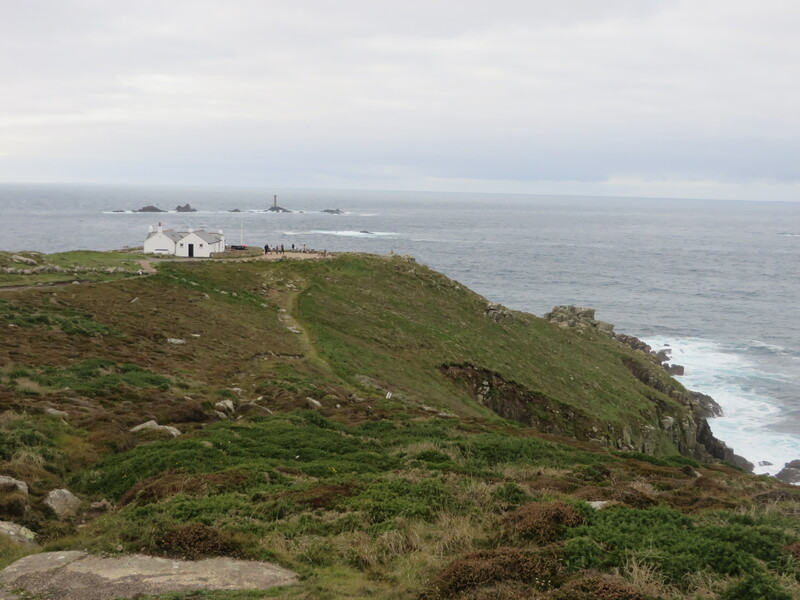 The most western tip of England is Land’s End . . . literally!! 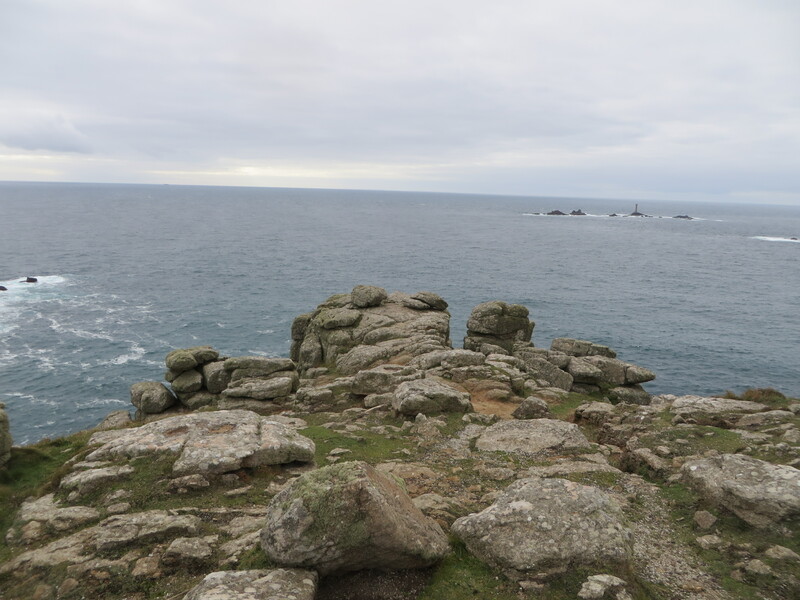 Standing at the last promontory of English mainland, gazing out over the vast expanse of Atlantic Ocean was exhilarating! 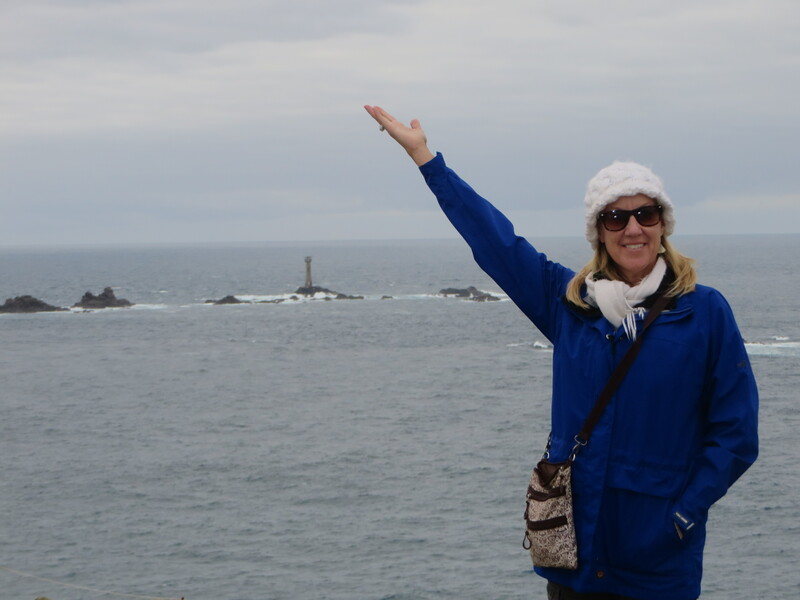 It was a rare clear day so we could see the Scilly Isles, 28 miles out to sea! 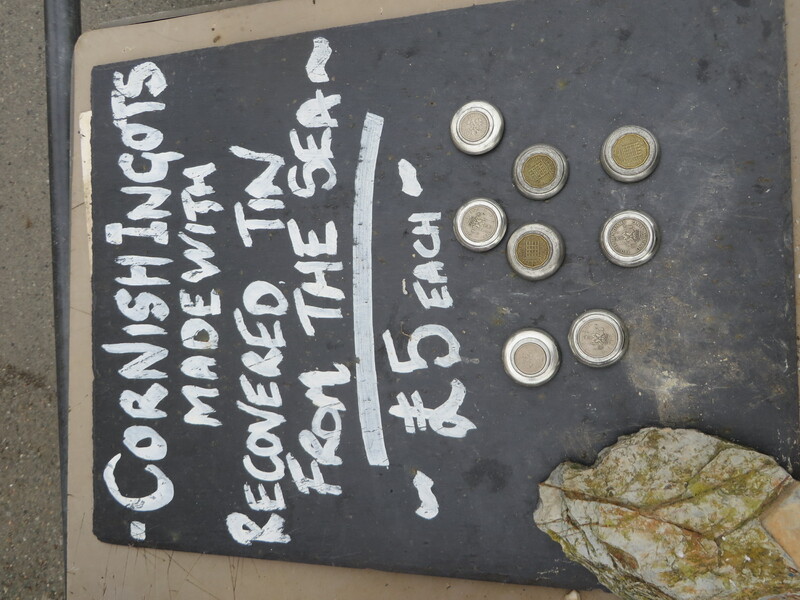 The quaint fishing village of Charlestown had Cornish ingots made from tin found in the sea for sale on the beachfront. 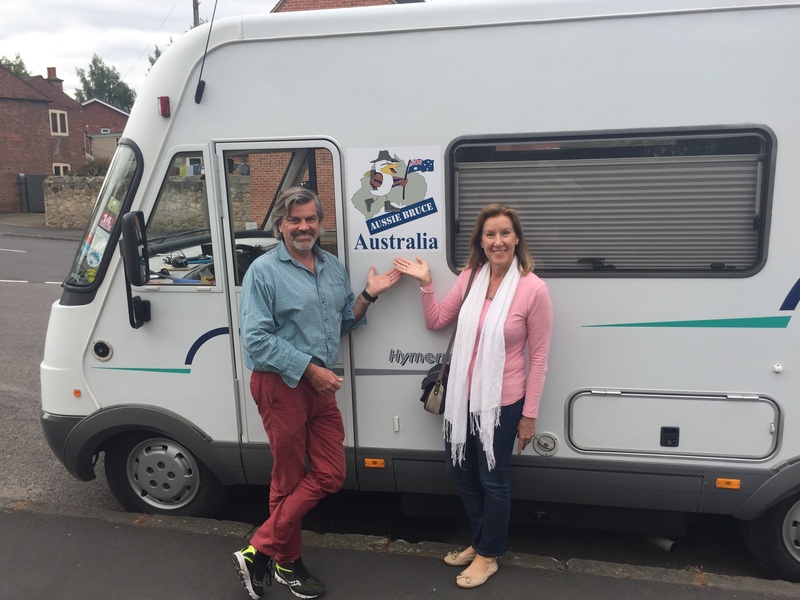 In lovely Teignmouth we caught up with fellow motorhomers, Su and Peter who we met in France in July. Camping Bruce in their driveway for the night we were treated to an international dinner prepared by Su with assistance from her 5 international students! 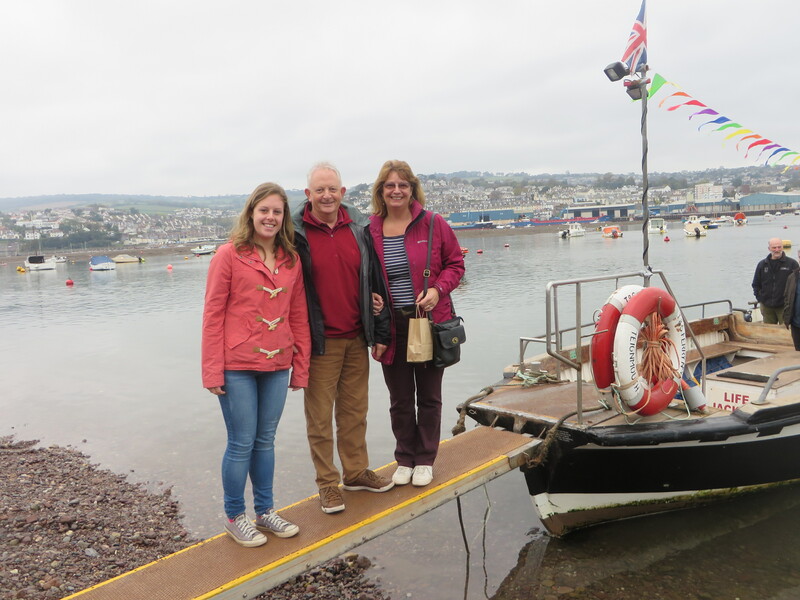 Su, Peter and Emily gave us a guided tour of the seafront & included a ferry trip …. 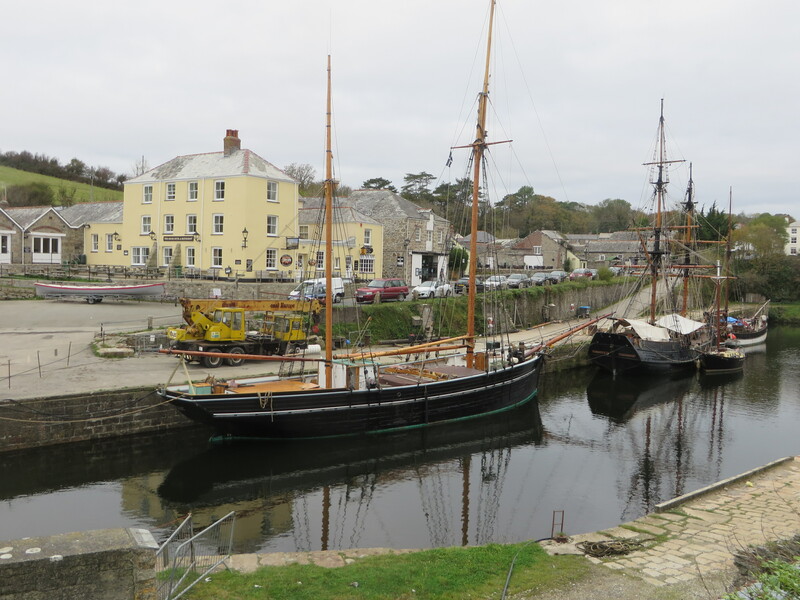 The country’s oldest ferry crossing dating back to 1296 or earlier! . . . across to the hamlet of Shaldon and thatched roof cottages. 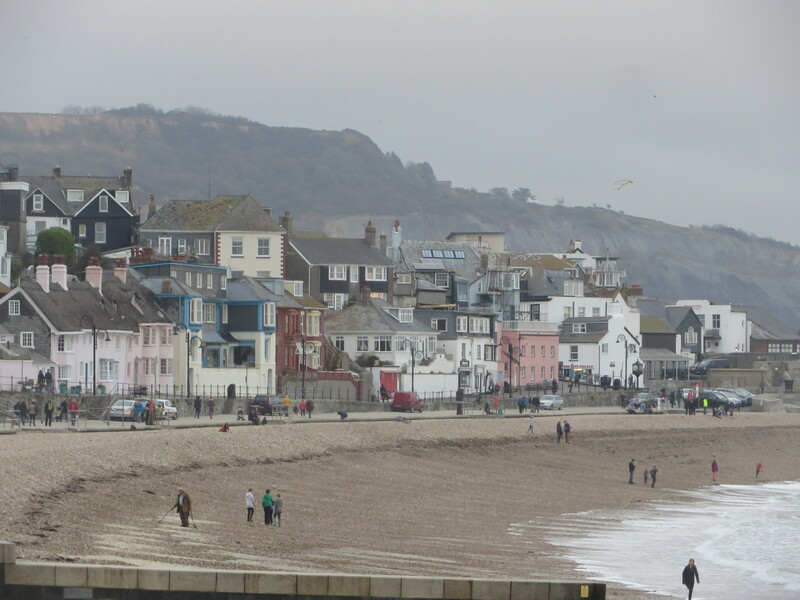 The charming old fishing village of Lyme Regis has many fossils & some of the 1st dinosaur skeletons were found here! 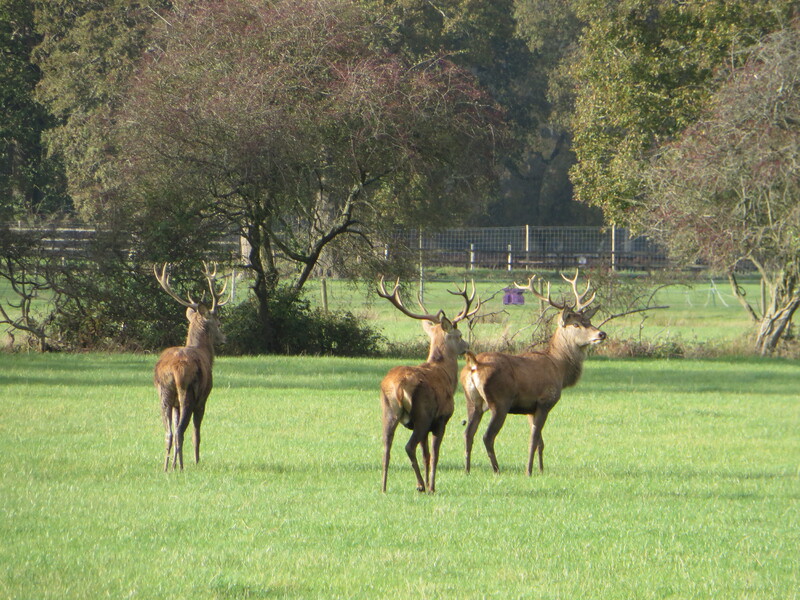 The New Forest is popular for its wildlife-filled landscape. 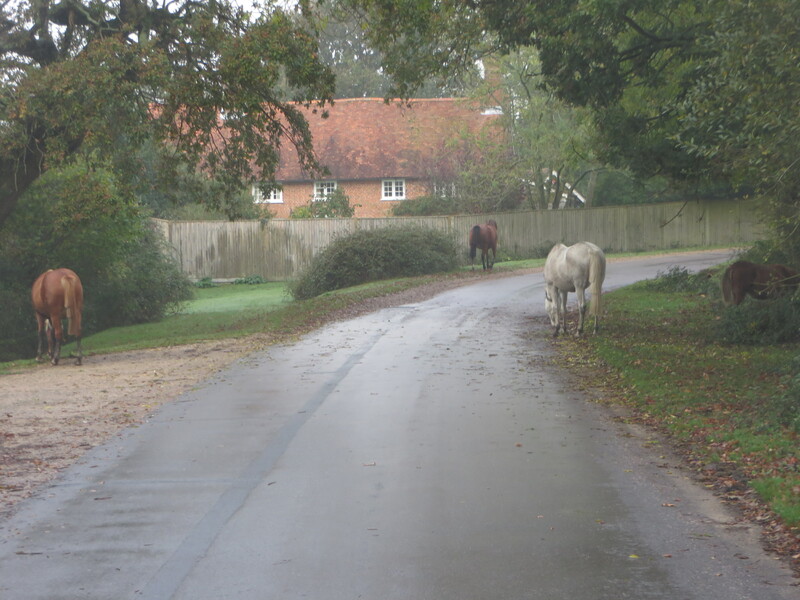 Wild ponies/horses, sheep, pigs, cows and deer wander freely the 192 square miles unfenced forest . . . a code of law first handed down during the reign of William the Conqueror !! 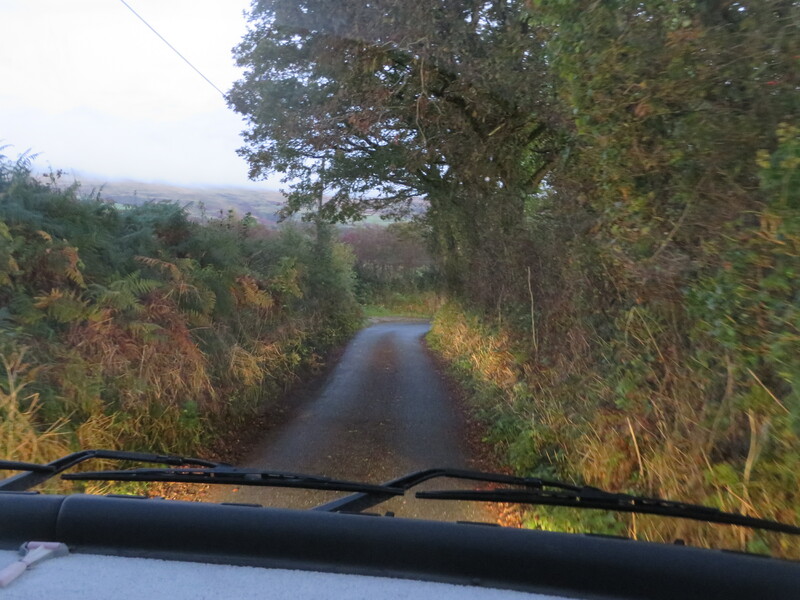 A large grey deer ran across the road infront of “Bruce” today! 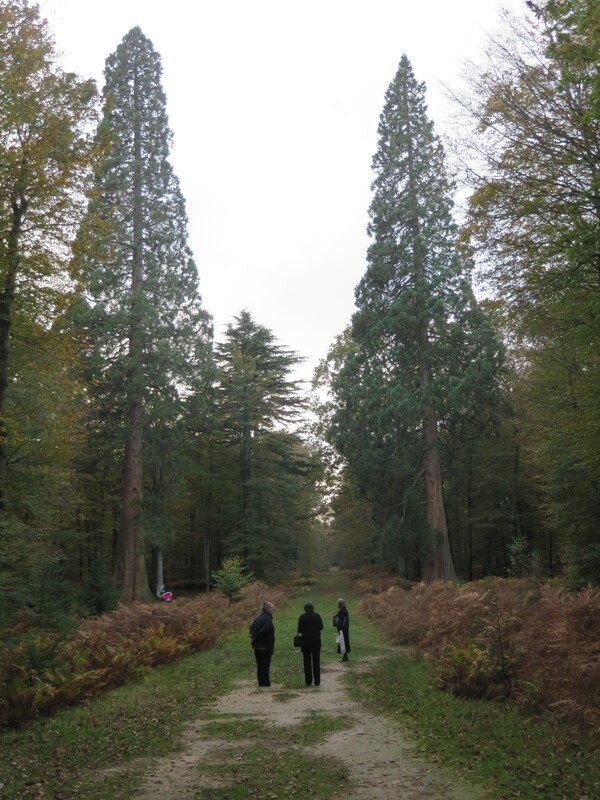 We also walked through the Tall Tree Forest. A great place to spend more time in the future on foot or on bike! 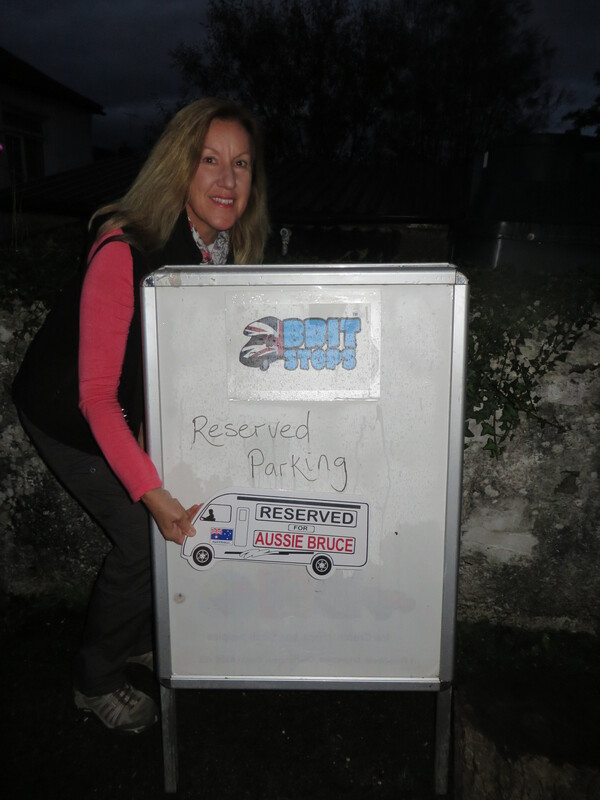 Our BritStop stay in the car park of The Crown Stirrup Inn, New Forest had an outdoor skittle lane for customers! They even provide a novel giant outdoor chair for our use!! 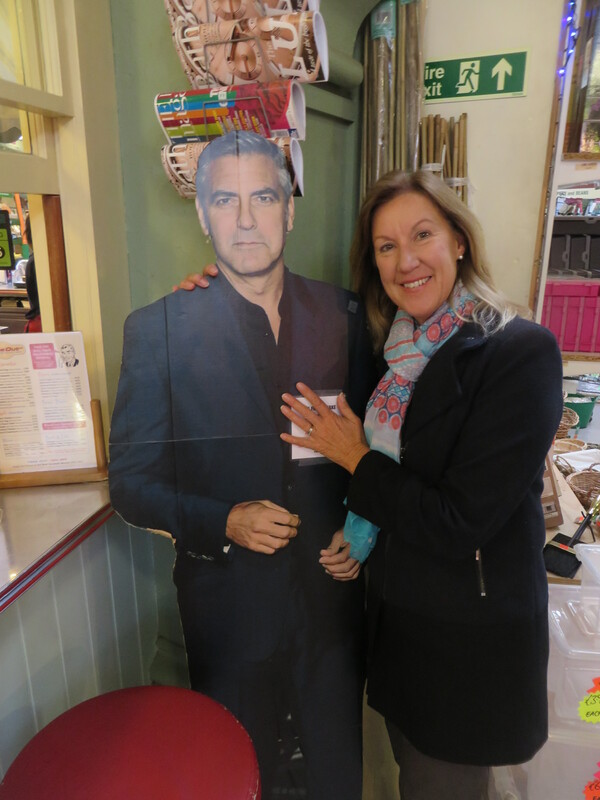 Bev could not resist a photo opportunity with George Clooney!! For those of you in his Fan Club don’t be too jealous . . . he was non-responsive, remote and very FAKE!!? Fantastic tour, nostalgic places. 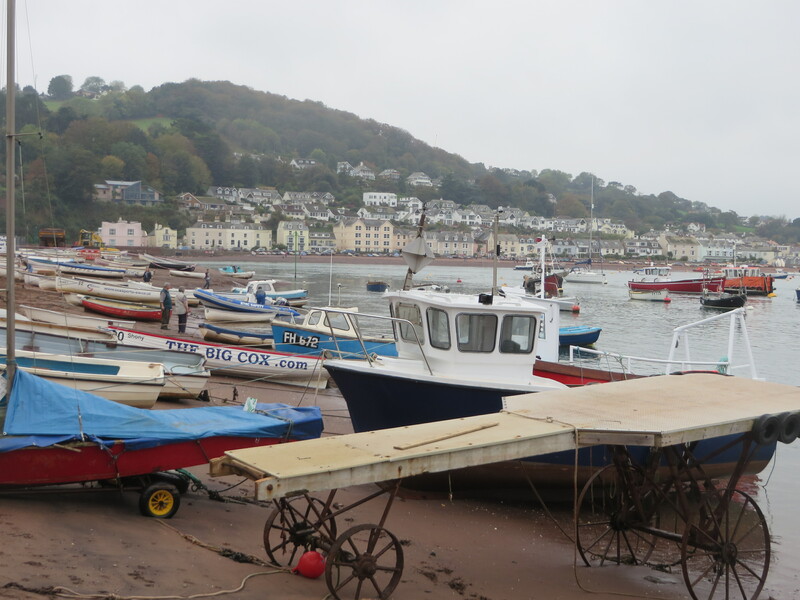 And… You managed to fit in Teignmouth and Shaldon, brilliant. I lived there for many years, my daughter, son – in-law and 2 grandsons moved back there 2 years ago from Fremantle. More fun and great pics! It’s not long now until you’re back on Aussie soil. If you want something to read Bev, on the long flight home, download a book called Remarkable Creatures by Tracy Chevalier. We read it for book club. 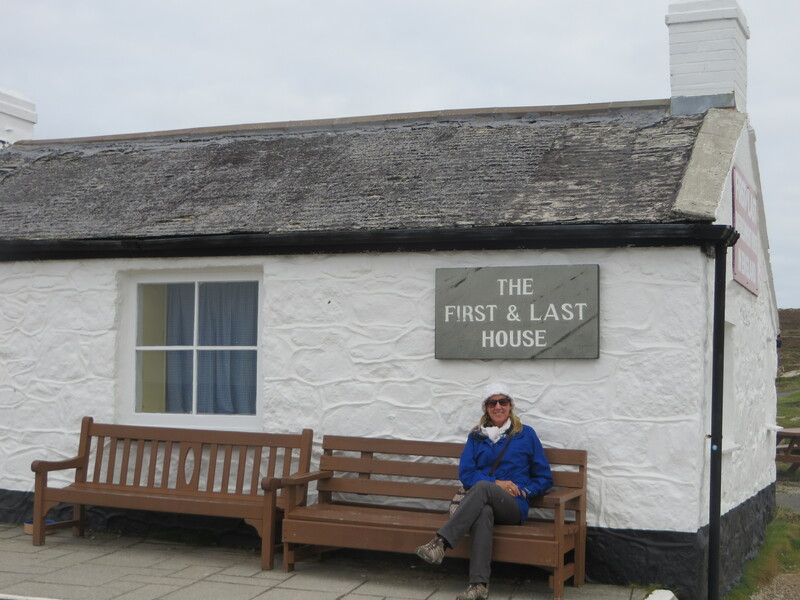 It’s a historical novel about the women who discovered of the first dinosaur bones in Lyme Regis and their lives. We all loved it. We are trying our best here to get summer happening for your arrival.